Tony Parker is a player that has made a great career despite being underestimated and undervalued. His rookie cards and autographed memorabilia echo that sentiment. 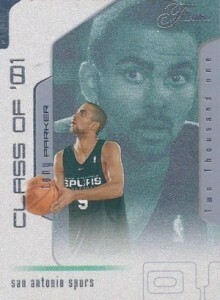 While he is a popular player, especially overseas, the value of Tony Parker cards remain on the low side. Like his teammate, Tim Duncan, Parker is considered a less exciting player, and the average collector does not assign nearly as much value to a player like that. The Belgian-born, French National, is one of many foreign acquisitions by the San Antonio Spurs that have helped set them up for an incredible winning consistency. Despite being taken 28th overall in the 2001 NBA Draft, Tony Parker has performed at an All-Star level for most of his career. 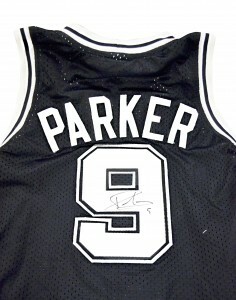 Parker has earned multiple NBA All-Star selections and four NBA titles. 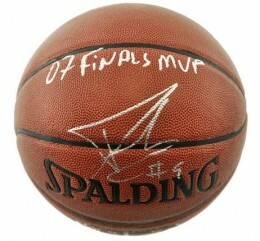 He was named the Finals MVP following the Spurs' 2007 championship. Tony Parker has many achievements as a player and a strong NBA profile, but is still known to many as the former Mr. Eva Longoria. Other than Tim Duncan, the success of the San Antonio Spurs seems to be more attributed to the system, rather than the players, and this is one of the reasons why Tony Parker struggles to receive the same media exposure as other prominent guards in the league. 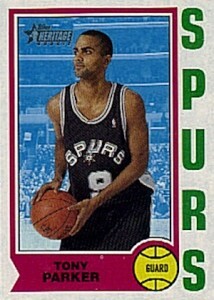 Collectors have plenty of low-cost rookie options when it comes to Tony Parker cards. Although the majority of his rookie cards are serial numbered, most are numbered fairly high and fall under the budget rookie classification. Of the 37 rookie cards, only two are autographed and three feature jersey pieces. These are among the most valuable choices when it comes to Tony Parker cards. 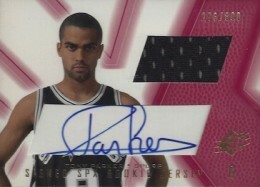 A simple design and huge signing area make SP Authentic the top Tony Parker card option. It would have been nice if he signed near the bottom-middle area and with a larger signature. Otherwise, it is a great rookie card with an on-card autograph. During the 2001-02 season, SPx decided that just one of these cards was not enough to properly honor the incoming rookie class. The result was three similar versions that each feature a different image of Parker and a different background color. This has to be one of the worst designs in recent memory. Bright and unnecessary colors with a bizarre background "X" design and rhombus-like cut signature area and jersey piece make for an awkward card. Producing one of these cards was bad enough, but three? On top of that, they are each numbered to 800. That means there are 2,400 of these cards. 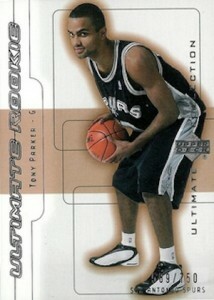 Having said that, they are the only Tony Parker rookie card that is signed and features a jersey piece. That does count for something, but these cards could have been so much better. 2014-15 IMMACULATE TIM DUNCAN TONY PARKER MANU GINOBILI TRI JERSEY 59 75!! 2014-15 IMMACULATE TIM DUNCAN TONY PARKER MANU GINOBILI TRI JERSEY 07 75!! 2014-15 IMMACULATE TIM DUNCAN TONY PARKER MANU GINOBILI TRI JERSEY 51 75!! Below you will find an example of what Tony Parker's authentic signature looks like. This can be used as a first point of reference for determining the legitimacy of autograph memorabilia, but is not a substitute for having your items authenticated by a well respected professional autograph authentication company. Reputable authentication companies include JSA, PSA, Panini Authentic and Mounted Memories to name a few. Click on any of the images below to view full size photos. The entire signature is largely indecipherable and instead, collectors should look for character traits and not specific letters. If you look closely you can see a series of triangles that best characterize Parker's signature; with two pointing to the right, one to the left and more angular than the others, one pointing up and one pointing down. In the middle of this maze you can make out what looks like the letter "A." 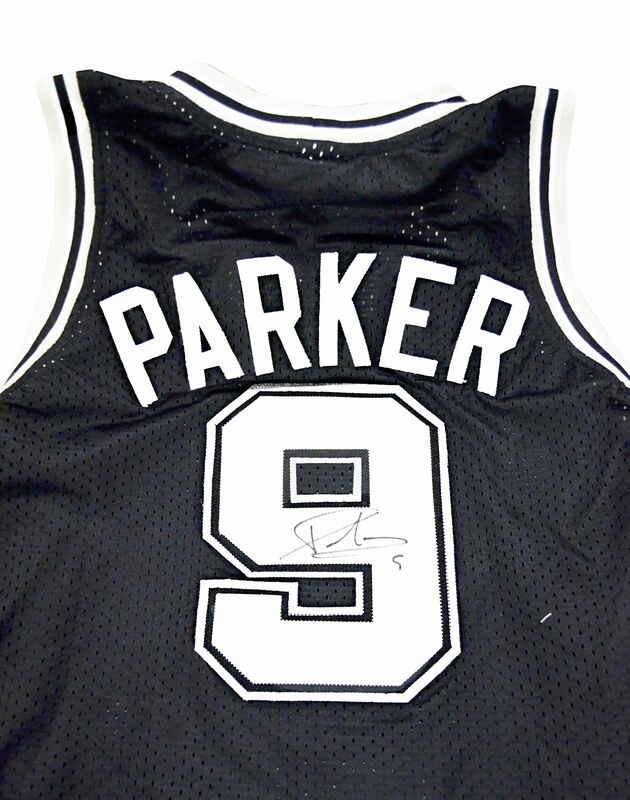 Tony Parker Signed Autographed San Antonio Spurs Jersey! PSA! 2018-19 Tony Parker - Panini Dominion Peerless Jersey On-card Auto Red - 04 25 !